Dimensions: approx 1.22" x 1.1"
These handy adapters allow you to quickly and easily mount an RJ45 8P8C modular jack connector onto a breadboard circuit. Each pin is brought out to the 8-pin single-row header on the bottom of the board; the single-row header can easily be inserted into a breadboard. This design allows the adapter to be placed on the edge of a breadboard, keeping cables and connections out of the middle of the breadboard where you are working. The pins are arranged in numerical order and each is clearly labeled with its pin number. 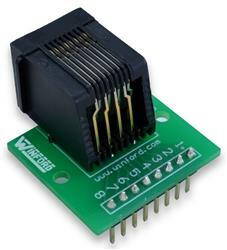 These adapters are particularly useful for breadboarding serial circuits since the RJ45 jack is often used for serial connections.